Sherwood Estate wines have a lovely story, they’re a real “Mom and Pop” set up. I haven’t checked whether they actually have children, and therefore are a real mother and father, but you know what I mean, a couple who started growing vines, making wine and taking responsibility for everything so that what you get in the bottle is exactly what they intended you to taste. They have staff now, but are still in control. I’m a real sucker for Mom and Pop operations. 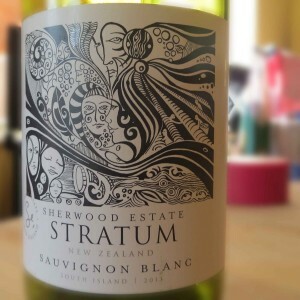 I’m also a sucker for interesting labels and this Sherwood Estate Stratum Sauvignon Blanc from Virgin Wines does hit my “cool label” buttons. Fortunately it doesn’t have a cute name, that would tip it over into cheese-mongousness. With the craze for adult colouring books continuing long beyond any reason, why not offer fun colouring in labels for wine bottles? Well, OK, because that would be weird, and may involve spillage, so let’s put a warning on the bottle to colour it in before opening. It’s a bright lemon yellow and it smells fresh and sharp. There’s gooseberries galore, a bit of crushed leaves, and a smidge of green pepper. I’m not a fan of green pepper in sandwiches or red wine, but it works really well here. It’s dry, but with a fruity sweetness and a crisp acidity. It has quite a body for a sauvignon blanc, feeling like quite a big wine. It tastes seriously fruity, all gooseberry and very little cats’ pee, which is replaced by that green pepper and a spritz of lemony goodness. I picked this up in a Virgin Wines mixed case and I’d certainly look out for it again.